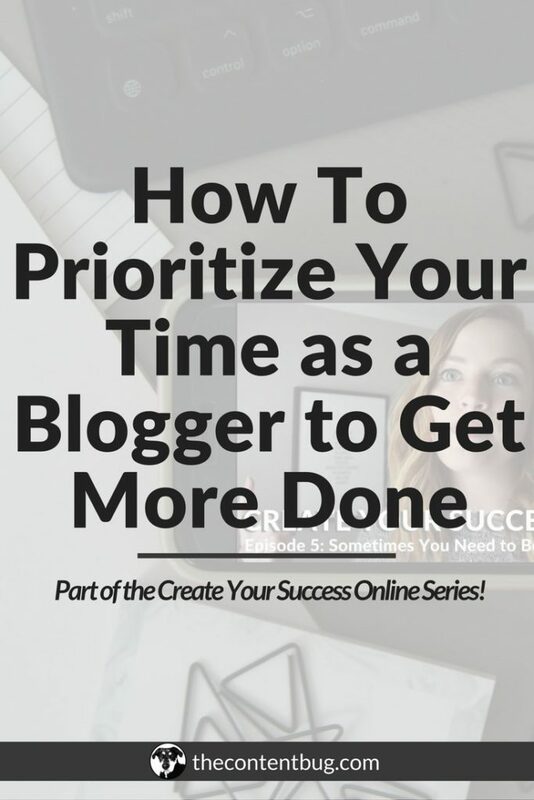 Have you ever scrolled through a whole blog post and exited out before reading more than 10 words? Raise your hands, guys! Because we’ve all been there. A few months ago, I started to take my blog reading more seriously. So I started to read a couple blog posts a week and most of the time I would just scroll through a few blog posts a day. Sometimes, I noticed that the posts just looked boring and I didn’t want to read them. And then other times, they looked so interesting that I had to read them. But then I went back to my blog and realized that my posts looked really drab. And I mean really drab! I was yawning just looking at my own website. Like, excuse me… WHAT?! If I think that my blog posts look boring, what the heck do other people think? Especially people who are coming to my blog for the first time?! So I did what anyone would do… I freaked out. I knew that something had to change. So I started to find ways to make my blog posts look more interesting. And now I’m in the process of spicing up all of my blog posts. That’s one of my big tasks for 2018. So now my goal is to rid the blogging world of boring blog posts. And in this post, I want to help you make your blog posts look more interesting! 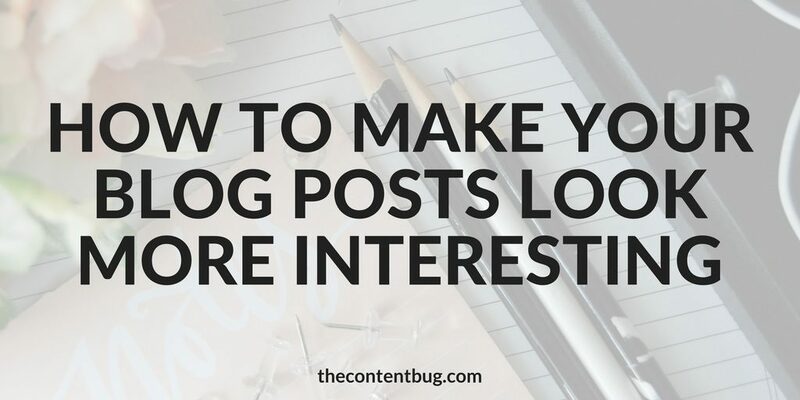 After my thorough research, I discovered some easy tips to make blog posts look more visually appealing and overall engaging for readers. I’m pretty sure I’ve mentioned this is every blog post that talks about writing engaging website content. But I’m going to include it here as well. There is nothing more boring than a blog post that contains paragraph after paragraph after paragraph. Instead, break it up a little bit. And include breaks in your post as you would break naturally in a conversation. You may notice that I include some sentences completely by themselves. Heck, I’ll write one word and then break to a new paragraph. Use one sentence. Break. Use three sentences. Then break. Use 2 sentences. Then break. And have some fun with it! You don’t have to follow any particular order. Just mix it up and start to break up your content so that isn’t any three 5 sentence paragraphs in a row. This works wonders for a boring blog post. Randomly add bolder phrases where you think they help to prove a point or are just important for the reader to notice. Most people will skim your content. It’s bound to happen. And you should expect it. When you use bolded text, those are the first words that your reader will notice. And if you don’t have any bolded phrases, you could completely bore them into leaving. In each section of my blog post, (that’s another great tip: sections!) I include at least 1 phrase that is bolded. To make sure that I retain the attention of the reader the whole way through. You may notice that I will randomly talk to myself throughout these blog posts. And sometimes, I may be talking to you guys. But these random thoughts I put in italics. I will also include some other phrases in italics as well if I think it makes sense. But most of the time, it’s just my random thoughts. And honestly, it may seem weird, but people like it when you talk to yourself. Because it makes your post seem real! And like they are actually getting a sneak peek into your mind. So if you really want to make your blog posts look and sound more interesting, include random thoughts and make them italicized. My blog template is pretty cool in the sense that all hyperlinks appear in my brand color blue. And I love it! Because then my texts is randomly broken up by some fun pop of color. But there is another benefit to include hyperlinks throughout your text. Recently, I wrote a blog post about Pinterest keyword research. (See what I did there with the hyperlink?) In that blog post, I talked a lot about Pinterest SEO. Now, some people reading that post might now know anything about Pinterest SEO. So either I could link to my blog post that talks about it, or they could run to Google and complete a search for themselves and get lost in someone else’s blog. Nope. No way, honey. I want you to stay on my site! So I’ll link to other blog posts that are relevant to the text that I’m talking about! This tip has a 2 part effect. It makes the text look cool with a different color and it keeps the reader engaged and on your site. So that’s a win-win if I’ve ever seen one! Now if you don’t like that idea. Which it would be pretty silly if you didn’t. I mean it helps with your SEO as well, if that’s what it takes to tip you over the edge into believing. But if you still don’t like the hyperlink idea, then I recommend include a RELATED or RELEVANT snippet at the end of your sections. This may not seem like it does a lot, but it helps to break up your content. And again, keep your reader engaged by offering them other blog posts you’ve written that they might enjoy! As a blogger, you can never have too many images! NEVER! Maybe it’s just the photographer in me, but blogging is really about the images as much as it’s about the content. So don’t be afraid to include 5 images in a blog post. I do that all the time. Plus some. Each section should have something to break it up. So whether that’s the “RELATED” snippet we talked about, an image, an ad, or an email opt-in, you need something! Because continuous text is just boring. So add images that support what you are talking about and help to enhance your blog post. Sure… some of these can be random. But when they can relate, make sure that they relate! 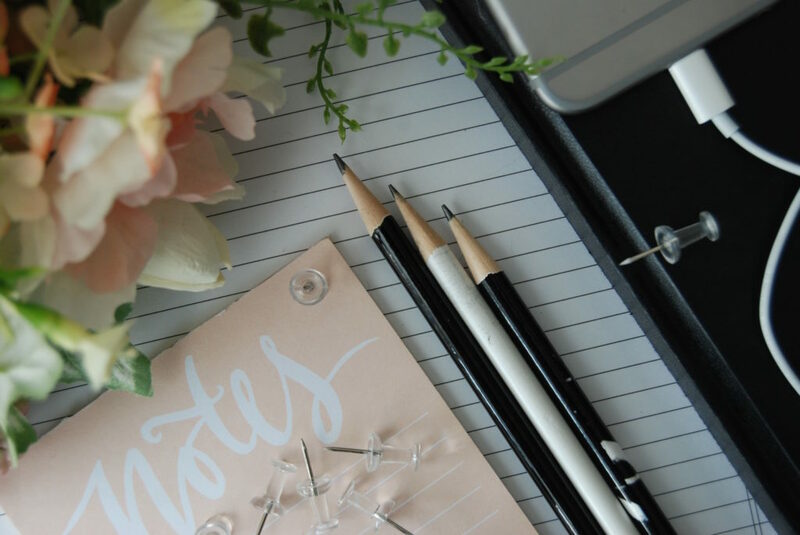 And if you don’t have anything to share, you can always fall back on an image of yourself, a flat lay, or an image that relates to the topic of your blog. When you use affiliate marketing on your blog, you need to include a disclaimer. And when I started, I knew that I had to include it at the beginning of my blog posts to abide by the rules. So I would include *This post may contain affiliate links* as the first sentence. BIG MISTAKE! This immediate will make people turn away and not read the post. So now what I do is include my affiliate disclaimer still in the first section of my blog post. But it’s placed right after my social media image in italics. This way it’s a little bit less noticeable. But it’s still there! Which is all that matters. Plus I think it looks much prettier in the layout of my blog posts. I read a blog post awhile back that said that removing your sidebar makes you look more like a business then a blogger. So I removed it. But the thing is, over time, I realized that I actually wanted to appear as a blogger and as a business. So how do you find a happy medium?! Well, I added my sidebar back. And I noticed a couple of things. The first was that my email opt-ins really improved! Because I had 2 opt-ins right in my sidebar which encouraged people to sign up. But it also improved the look of my blog posts! It makes them look a lot more interesting and engaging! And add an image to download my Roadmap to a Long Lasting Blog Career resource. Now my sidebar is more image heavy and is more interesting to look at. If you can learn one thing: people loooove images! So yeah. Add a sidebar and spice that baby up! If you need an example, scroll up and look at mine on the right-hand side. 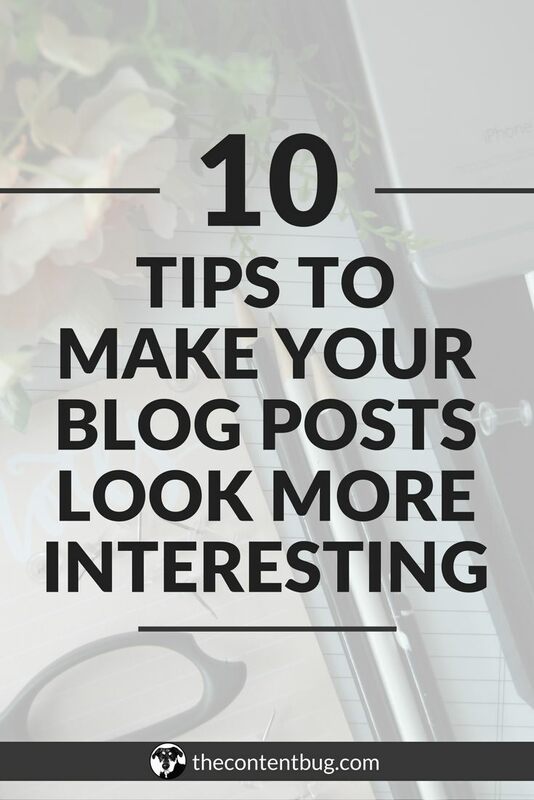 So maybe you think that added 10 images to your blog posts to make it more interesting is actually a little bit too much. And I get it! That is a lot. So what you can do is add email opt-in’s instead. 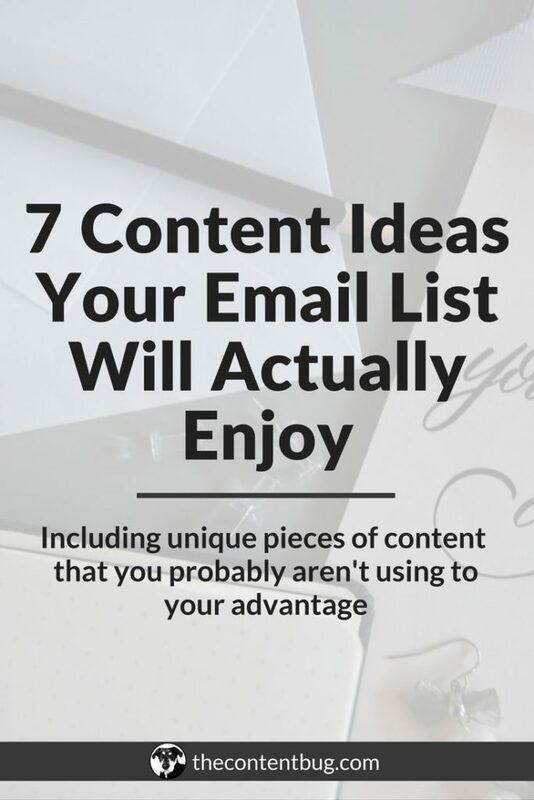 Did you notice the email opt-in’s I’ve included in this blog post? These opt-ins are a great way to grow your email list. But they are also a great way to break up your content! I recommend creating graphics for your email opt-ins. Because here’s the thing. People are more likely to sign up for your email list is they don’t see the actual form to fill out first. It’s super weird. But it’s true. So if you include an attractive image that makes them click to sign up before they enter their information, you’ll have a better success! Plus, you should have at least 3 email opt-ins per blog post if you want to really grow your email list. Which is key to your success online. If you aren’t having fun with your blog posts, how can you expect your readers to have fun?! One of the best things you can learn in the blogging world, actually just the world in general, is to take life a little less seriously! The more you have fun, the more you’ll get out of everything you do. So have some fun with your blog posts. And let the true you shine through. The more I stopped caring about what people thought about my blog posts, the better they became. And the more people actually liked them. So I encourage you to write like you’re talking to a friend. Use natural language. Add some humor. And spice it up any chance you can. Again, if you’re having fun, you’re audience will be having fun as well. Make your blog a party! And the party will come. Yeah. That was a lot. But I kinda liked it. And I think that’s really all I want to say. So to make it easy on the people that just scrolled to the bottom (despite how interesting I made this blog post!!! ), here’s what we covered. It’s boring. And no one likes it. So just stop. This is for all you skimmers. We’re just trying to make your skimming easier. Blah bitty blah. Random thoughts inserted here. Keep up wanting more and change the color of your text! You already know what the reader is into, so give them more! You can never have too many! … Or can you? Be discreet but still follow the rules. It makes a big difference. THIS IS HUGE! Just do it, okay? Tired of adding rando images? Then add email opt-ins! And have some darn fun! I sound like a grandma telling you to have fun at your middle school dance. But put a smile on your face and have some fun! I think I might have had too much fun in this blog post. It’s probably just the coffee running through my veins. So I’m going to wrap this up and wish you the very best of luck making your blog posts as interesting as possible! And make sure that you connect with other amazing bloggers in the comments down below! I’m so glad that you enjoyed this post. For so long I just thought that my blog posts were starting to look a little blah so I decided to find new ways to make my blog posts look more interesting. And of course, I wanted to share what I learned with you guys! Thank you for the sweet comment! Keep working hard on your blog posts! Hi Cath! This was a very interesting read. Especially your point about the sidebar. 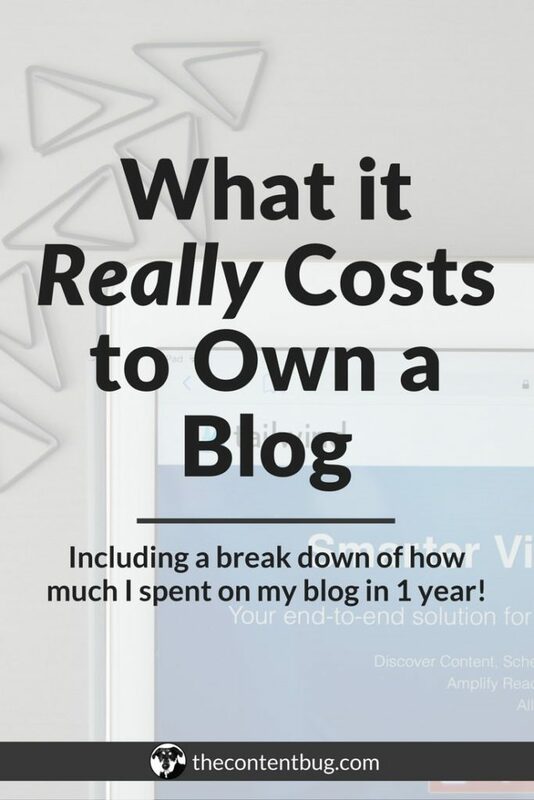 I noticed that many bloggers stopped using it and was wondering why. It makes sense that they want to appear more professional and business-like, and some of them should aim of that. But yeah, not every blogger should portray themselves as a business. For me, I like to have my sidebar active, and I only remove it from certain pages and blog posts. I removed especially because I don’t want my readers to be distracted by anything else on the page except the content they come to read. That means that I only remove it when the content is 100 % well targeted and should be consumed in full. I do leave space at the bottom of the article for a “related” section and throw in a couple of opt-in forms within the articles. That way I’m sure to keep them engaged and get them to subscribe too. That’s some great insight! And I totally agree! Some pages, I opt out of using my sidebar because I think it would distract from the main message of the page. But for blog posts, it’s a must for my website!